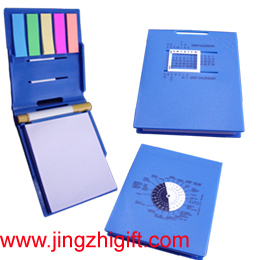 JZH-42-B with calendar and a world time-zone calculator or JZH-42-C with five "rainbow" sticky-note strips inside. The tray is 92 x 112 x 16 mm and holds an 80 x 94 x 10 mm pad. Company Name: Shenzhen Jingzhi Gift Co., Ltd.